We examine geographical differences in percentages of age-1 Pacific saury Cololabis saira with previous spawning experience collected from 143°E to 165°W during June and July of 2013 and 2014. Previous spawning experience of fish was determined using a new histological method involving Victoria blue (VB)-positive ovarian arterioles. We also compared the radius of the otolith annual ring (ROA), which indicates fish body size at the beginning of the breeding season, with the incidence of previous spawning experience. A generalized linear model was used that treats the occurrence of fish with VB-positive arterioles as a response variable, following the Bernoulli distribution of probability pi, where longitude, latitude, body length, ROA in age-1 fish, year (2013 or 2014), sea surface temperature, and days elapsed from a survey starting date, are used as fixed effect terms. An estimated regression coefficient of longitude was negative while that of ROA was positive, meaning that the probability of previous spawning increases with a latitudinal progression west, and with increased ROA. Our results suggest that differences in the percentage of previously spawned fish in different geographic areas are caused by differences in body length at the beginning of the breeding season. We are grateful to Dr. Toshihide Kitakado, Tokyo University of Marine Science and Technology, and Dr. Yasunori Sakurai, Hakodate Cephalopod Research Center, for their valuable comments. We thank the crews of the T/S Hokuho-maru from the Hokkaido Board of Education and R/V Hokko-maru from the Hokkaido National Fisheries Research Institute, Fisheries Research Agency. We thank Dr. Vijai, State Key Laboratory of Marine Environmental Science, Xiamen University, for reviewing this manuscript. We also thank Junko Momosawa, Naoko Kubo, and Kanae Okabori of TNFRI for measuring fish and otoliths. 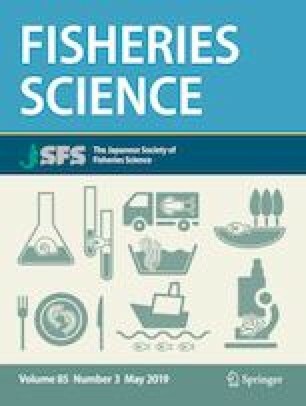 This study was supported, in part, by the Fisheries Agency of Japan.